One of the most striking structures of the Marina Beach, the MGR Memorial is built as an ode to the former Chief Minister of Tamil Nadu, M. G. Ramachandran. Sprawling an area of some 8.25-odd acres, this Chennai attraction lies adjacent to another important attraction of the city the Anna Memorial. MGR memorial has been observed to receive the highest footfall on the seafront. In recent times, the attraction has gained more popularity being the burial site of former Tamil Nadu Chief Minister and MGR's protege J. Jayalalithaa. To avoid crowds, visit the site early in the morning. How popular is M G R Memorial? People normally club together Gandhi Statue and Cholamandal Artists' Village while planning their visit to M G R Memorial. What is closed tym of mgr memorial.? 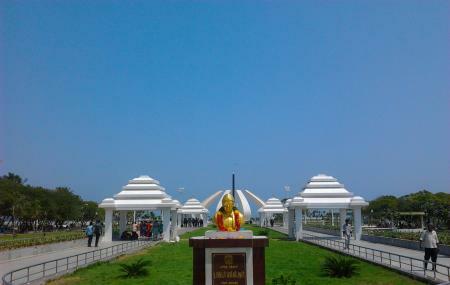 One of the attractions in the city of Chennai in and around marina Beach. A political heavyweight who is regarded widely as the architect of modern Tamilian politics. It is located just by the main road that is on the beach itself. Visible from the main road. Entry is free and the compound is quite large in size in the middle of which the memorial is located. The place is okay but quite dirty. Government should take care of the beach to make it clean. Beach should be look like clean & naturally beauty so that it can attract the tourists.